Do you believe code is beautiful? Code like a Girl! I was web surfing a couple of weeks ago and found this great blog post about how someone said they coded like a girl, meaning they made ‘pretty’ code. And following this concept, I found this truly excellent post from the Creating Passionate Users blog (which I highly recommend) called Code like a Girl. Here’s a great set of pictures from this post. She also has several books that she recommends such as Machine Beauty by David Gelernter and she references this post called Beautiful Code, test-first that is a different take on this and is about how the author balances the desire for beautiful code with the test-first approach. The comments are very interesting also. 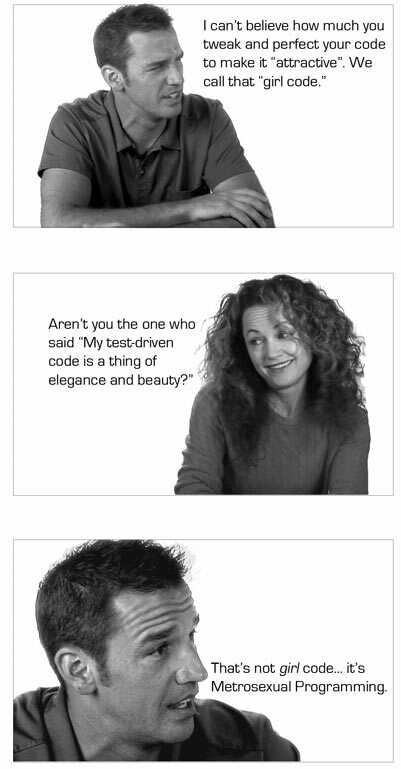 And here’s a bonus, someone has created “code like a girl” t-shirts and paraphenalia on cafepress. And speaking of t-shirts, this was another fun post by her about conference t-shirts called “What Conference T-Shirts can Tell You“. And this one called “Female Friendly Tech Shirts“. So if this sounds interesting, go read her post and then browse through the Creating Passionate Users blog. I’m sure you will find many more interesting posts. BTW, here is also a book that she co-authored called “The Emo Programmer“. Kathy is also the co-creator of the bestselling Head First books (the brain-friendly series from O’Reilly).